Welcome to part one of a series I am doing called Species Spotlight. Each entry will showcase one particular species of invertebrate, whether it’s a butterfly, a moth, an arachnid or a millipede. Wherever possible I will use my own photographs and each entry will feature general information of the species as well as any additional notes that I can add, based on working with said species. The topic of this entry is the Pipevine Swallowtail, Battus philenor. Welcome to part two of my caterpillar food plant series (the first of which was on Saturniidae moth food plants seen HERE). 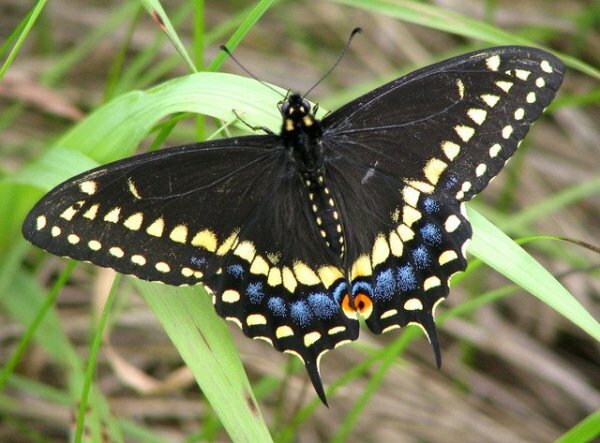 For this entry I am focusing on the five species of Swallowtail butterflies (family Papilionidae) from New England. This list does not include strays; only species that can be found in this area normally. The Papilionidae, numbering over 700 species worldwide, are among our largest and most spectacular of butterflies! Carrot (Daucus), dill (Anetheum), fennel (Foeniculum), parsley (Petroselinum), Queen Anne’s lace (Daucus), rue (Ruta).